KATHMANDU, Oct 8: Singers Deepak Bajarcharya and Kamal Khatri grabbed the limelight at the 20th Annual Image Award, held in Hotel Crowne Plaza Kathmandu, on Saturday. Both singers bagged two awards each. Bajarcharya won the ‘Best Music Video’ and ‘Best Vocal Performance — Pop Male’ awards for his song ‘Mann Magan’. Khatri’s ‘Jaula Relaimai’ received the Best Composition of the Year and Best Song of the Year awards. Composer Prakash Gurung was felicitated with the ‘Lifetime Achievement Award’ for his contributions in Nepali music industry for over three decades. 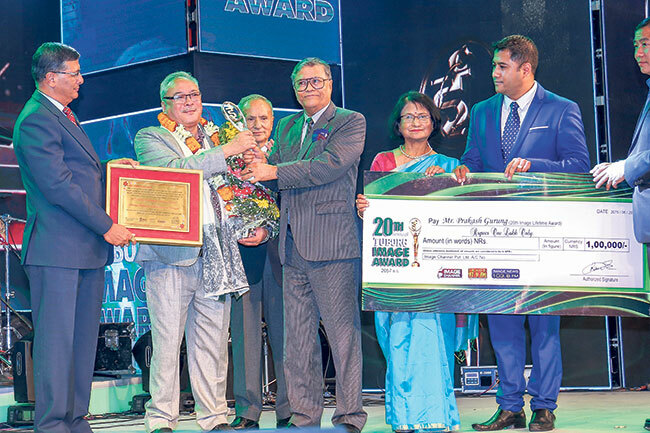 Likewise, Kulman Ghising, the managing director of Nepal Electricity Authority (NEA), was also conferred ‘Personality of The Year’ for contributing to eliminate load shedding from the country. The event also comprised energetic performances by the Nepali folk ensemble, Kutumba, Nima Rumba, 1974 AD, Cartoon Crewz, and many other artists. 20th Annual Image Award concluded with a sizzling dance performance by actor Priyanka Karki.